Petrobras is starting to look like the Gazprom of Latin America. The Brazilian petro-giant may not suffer from the same perception of widespread corruption as its Russian gas counterpart, but both companies have been pressed into government servitude at the expense of ordinary shareholders. Petrobras shares have fallen so low it’s like 2007’s huge offshore oil find – hailed by former President Luiz Inacio Lula da Silva as a “gift from God” – never happened. But it’s not too late to change course. Gazprom has been shelling out an average of about $40 billion a year since 2009 to shore up domestic gas production and protect the country’s grip on European energy supplies – about double what Norway’s Statoil has been investing as a percentage of sales. A lot of it is probably wasted. Gazprom’s $46 billion South Stream pipeline, for example, makes little sense except as an instrument of the Kremlin’s foreign policy. Domestic price controls limit its ability to make money at home. Investors have punished Gazprom accordingly. Its shares trade on a risible 0.3 times book value, and just 2.3 times estimated 2014 cash flows, according to Thomson Reuters data, a huge discount to Statoil on 1.3 times book and four times forward cash flows. Petrobras isn’t doing much better. Regulated domestic prices mean its refining arm is losing money. Meanwhile, the Brazilian giant’s capex – bolstered by a gargantuan 2010 capital increase – has averaged 28 percent of revenue since 2009 as it rushes to develop its offshore deposits. Some estimates have pegged the bounty at more than 50 billion barrels of crude, enough to turn Brazil into a top global oil producer. But state meddling, including requirements that Petrobras favor local suppliers and keep large stakes in offshore projects, has scared off both investors and some potential drilling partners. The Rio-based company’s shares recently hit levels last seen in 2005 – leaving shareholders worse off than before the “gift from God” materialized. On 0.4 times book value and 2.4 times expected cash flows, its valuation is scarcely higher than Gazprom’s. Petrobras may be at low ebb – investors can still probably trust Brasilia more than the Kremlin to do right by the public’s resources. But being lumped in with such inauspicious company should be a wake-up call for President Dilma Rousseff. 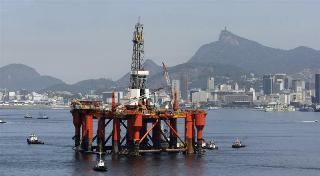 A Petrobras oil platform is seen at Guabanara bay in Rio de Janeiro. The petroleum giant is understood to be eyeing new rules to expedite its planned US$25bn equity sale. Shares of Petrobras, Brazil’s state-controlled oil company, have fallen more than 35 percent since November, adding to a near-70 percent slide since 2009. The company trades on 0.4 times book value and 2.4 times expected cash flows over the next 12 months, according to Thomson Reuters data. Gazprom, the Russian state gas exporter, trades on 0.3 times book value and 2.3 times estimated future cash flows. Brazil’s production from so-called “pre-salt” deposits was 300,000 barrels per day as of August 2013 - about 15 percent of Brazil’s overall crude production, according to Brazil’s national energy agency. The pre-salt reservoirs have been estimated to contain more than 50 billion barrels of recoverable oil and gas.